A pioneering project that provides the marginalized sector of our school-children with an improved opportunity for basic educational instruction as enjoyed by regular students. A core advocacy of the Rotary Club of San Juan del Monte, R.I. District 3800, headed by Special project Chairperson PP Annette Esparaz; is to provide participative opportunities for the blind and the visually impaired section of our society. Realizing the critical role of Arts and Culture in molding well rounded citizens who are aware and proud of our rich Filipino heritage, we began our push for Art Education Opportunities for the blind. In partnership with Metropolitan Museum of Manila, we developed and launched TOUCH THE ARTIST VISION, a pioneering program in Philippine Arts that provided Tactile Drawings and Audio Guides of select artworks in the Museum like those of Fernando Amorsolo, Juan Luna, Hidalgo, Manansala etc. now for the first time in the Philippines, the blind enjoy a meaningful experience inside a Museum. The response to this was very positive that this project is ongoing to date, with other Museums joining the bandwagon. Our numerous encounters during this endeavor bore another challenge we boldly undertook, with the goal of furthering our commitment to enhance the lives of our marginalized brothers. 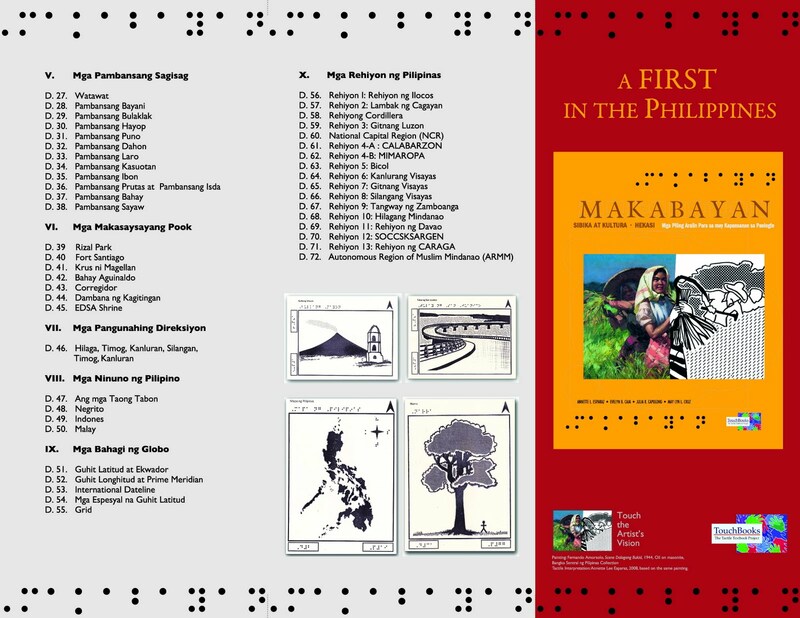 Working closely with SPED teachers (with decades of experience in teaching the blind), we embarked on another FIRST in Philippine History: Touchbooks: The Tactile Textbook Project. In the 100 years history of teaching the blind in the Philippines, this is the first visual standardized instructional material that SPED Teachers can use. The sad reality is that basic education opportunities for this sector are highly compromised due to lack of teaching tools that teachers for the blind could use. Finally, visually impaired children can now ‘visualize’ correct images of their lessons; instead of merely relying on the verbal description of their SPED Teachers. With Touchbooks, we developed standardized, tactile illustrations of key images and concepts taught in basic education that will maximize learning during given school hours. Touchbooks come with audio narratives that allow simultaneous instruction of blind students. Our first Touchbooks project is Makabayan: Sibika at Kultura • Hekasi, which provides select lessons covered from Grades 1 to Grade 4. These three volume books utilize a special Swell Paper Tactile material for the blind child to “see” picture images for the first time. The three volume book with 72 Tactile images and audio narrative in the Filipino language cost P18,688.00 a set. The materials are imported from England, the printing and testing of each page is done manually. The four authors: Annette L. Esparaz, M.A. Cultural Heritage Studies, May Lyn L. Cruz, Education Programs Manager of Metropolitan Museum of Manila, together with multi-awardees SPED trainor for High School Evelyn B. Caja, M.A. and Elementary SPED trainor Julia R. Capulong, M.A. gave their services for free. There are currently a total of 409 SPED Centers including Public Schools catering to the blind and visually impaired children nationwide. Some centers may have 3 to 50 blind/visually impaired students who are mainstreamed (the visually impaired students studies with sighted students). To equip each school with just one “Makabayan” book set will cost a staggering Php 7,643,392.00. 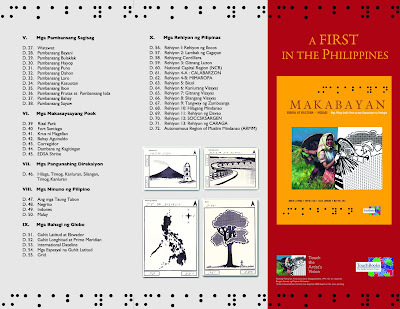 A book launch and successful fund raising was conducted in Metropolitan Museum of Manila and radio announcements brought in generous donors for the book. When school opens on June 15, a hundred schools will be using this new technology. It is going to be exciting to hear from teachers and students how the book had helped them. Check us out in facebook “Touchbooks” and for inquiries you can email us: touchbooks@gmail.com. We praise God for allowing this project to come to its completion.